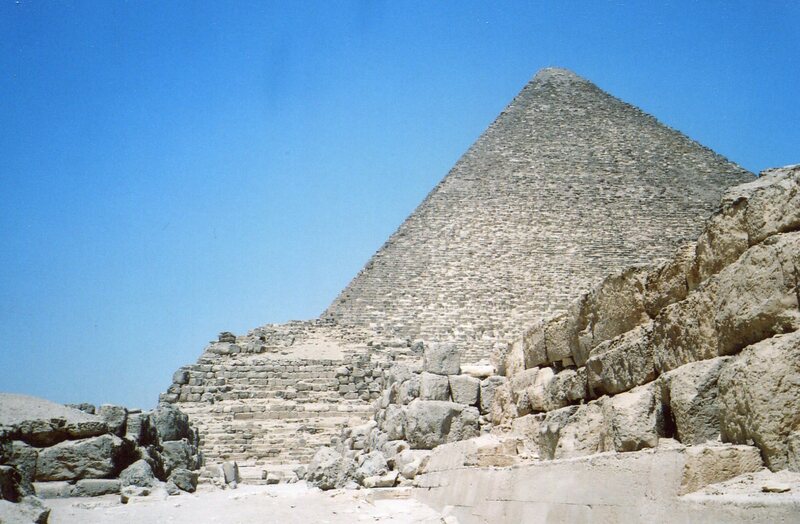 The Great Pyramid at Giza was already ancient when Homer’s epics laid many of the ancient West’s foundations. Yet it’s as tall as a modern skyscraper. In its original limestone casing, it soared to 481 feet. Its builders lived around 2550 BCE. That was more than 2,000 years before China’s Qin Shi Huang’s army of laborers erected his pyramid. What could have inspired such early people to build so big? One of the most influential Egyptian cosmologies came from Heliopolis. This was a ritual center a little north of Giza, on the east side of the Nile. In the beginning, all was water. This primal ocean was called Nun. Then the universe’s creator, Atum, emerged as a mound (bnnt). He was self-born, expanding as the mound in the primal waters. 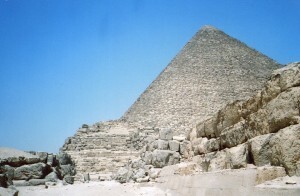 The Egyptologist Mark Lehner thinks that Egyptians associated the rising primal mound with the land around the Nile emerging after its waters recede. The soil is now fertile enough to allow growth that will support life, civilization, cosmic order and everything else good and beautiful. So the primal mound is a place of creation and rebirth. Atum sneezed and spat, and the first pair of gods emerged: Shu and Tefnut. Shu was the god of air and wind. Tefnut was the goddess of moisture and mists. These two gods gave birth to Geb, the god of the earth, and Nut, the sky goddess. She was sometimes imagined as a cow. At other times, she was painted as a woman with the stars passing through her body and emerging from her womb. Geb and Nut then gave birth to Osiris and Isis. They then brought forth Seth and his consort, Nephthys. Seth slew Osiris, but Isis revived his fertility, which generates the crops. 1. The stress on the emergence of fertile land from waters. 2. Symmetry–a series of pairs of deities as the sources of cosmic order. 3. The human scale. The emerging generations of gods didn’t extend into vast numbers, as they often did in Indian cosmology. From Atum came Shu and Tefnut. Then Geb and Nut were born. Then came Osiris, Isis, Nephthys and Seth. They’re the sources of the land’s fertility and society’s prosperity. Pyramids were thus associated with the primal mound as the source of all creation. They were also linked with renewal, as the Nile renews the land’s fertility. These ideas reflected more than a 1,000 years of settled life on the Nile before the Great Pyramid at Giza was built. The symmetry in the heavens mirrored the two banks of the great river. The human scale reflected communities living in a narrow valley between vast deserts. So the pyramids emerged from a cultural landscape that was already very old. But pyramids embodied other ideas too. Egyptians were inspired to build them because they had a network of meanings that pervaded their society. 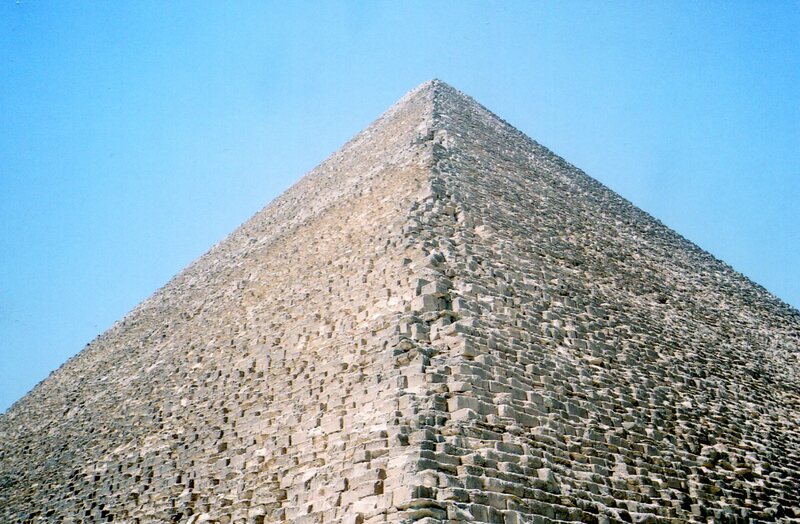 We’ll keep scaling the Great Pyramid in the next post.